Several of my last posts have been about Iraqi refugees here. I think this informal miniseries on Iraqis may be coming to an end now. I almost feel like I have hit a such point in depth and soberness it's now time to revert to a more palatable reality for a while. But first I am going to share the question that has been haunting me these months that I've spent with Iraqis. What has happened to this beautiful heart of civilisation? I recently attended a "party" held to commemorate the end of a summer camp sponsored by a local convent for Iraqi children. There were just over 200 children bussed from their homes to the largest church in town in order to watch each other perform. 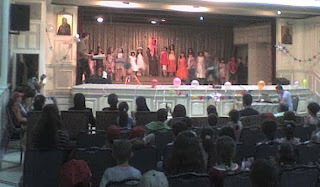 Pictured is the finale of a fashion show type of skit, in which a few dozen children dressed up in different types of garb, ranging from formal-wear to traditional Arab, from ghetto fabulous to karate to spiderman! All the children, audience and performers alike were well-dressed, well-behaved and fun to be around. The camp counselors were volunteers, mostly young Iraqi adults. They did a great job of teaching the kids, took their jobs seriously, and were also great fun to be around. I sat in the back of the hall and thought, "This is a room full of refugees?" These people with a sense for fashion, impressive musical skills (at one point a dozen boys got up on the stage and showed off their breakdance moves! ), ability to have fun and overall respect for each other... this is not what I tend to think of when I think of refugees! In fact, I have met very few people, refugees or not, who are overall, as a community from a given place, so cultured: hospitable and generous, well-educated and thoughtful, interesting to talk to and interested in different types of people. When I ask Iraqis if they want to return home, most of them say no. They say no because, "Iraq is lost." Just this morning, a young woman explained to me that if Iraq could go back to what it was before, she'd be the first person on the bus home. But that won't happen, not for a long time. If it happened this year, she'd go. But it won't, so she and her family are fighting to get resettled in the United States. In its current state of instability, Iraq may feel lost, but the loss will become permanent when well-educated families like hers are finally given the opportunity to move on. Right now, they are living in limbo, waiting for that precious visa out of here. But a small part of them still dreams of returning home and rebuilding their country. As soon as that visa comes, they can start living their lives again, but Iraq will be lost. I don't want to make a political statement, because I actually do see this war as a double-sided issue, but from the perspective of a sociologist, I am both fascinated and horrified at the thought of a culture disappearing over the course of half a decade. Doctors, university professors, musicians, painters, cinematographers... these are the Iraqis I have met in exile. They speak of beautiful spacious houses that they had to flee and delicious healthy food that they can no longer afford to eat. Their entire heritage is being splattered across the world, making life richer for all of us who meet them, but leaving their own country culturally bankrupt. Is it really possible that Iraq is lost? What will happen to its culture, passions, tastes, history? This afternoon I was invited to translate for a football coach helping with the sports component of a summer camp currently running for Palestinian Iraqis living in this country. As one of the players explained to me, they are twice-refugees. Several decades ago their families fled Palestine for Iraq, where they'd been treated like citizens but had never become citizens. Now they've had to leave that and are refugees again. A third time seeking refuge is not allowed, he said - their next destination absolutely must be a place where they can stay. A country that they can make their home and be given full rights including citizenship. As I, the only woman in the facility at this particular hour (the women participants were on a swimming outing), sat on a plastic chair brought out especially for me, I observed these attentive, hard-working boys. They were of all ages, but most of them were in the 18-30 years age range. Most wore shoes but not all. Their clothes were clean and tidy, but very simple and rather worn. These two dozen young men sported every type of fashion for athletic chaps imaginable, ranging from surfer dude to school geek to plain old poor taste to footballer pro. When the visiting coach asked for their attention they gave it. When he played with them they tried to keep up, but their sense of awe may have hindered their ability to focus. When the older man who was their leader gave them an instruction, he to was readily obeyed. You could feel the mutual respect flowing through the group. And when I asked for water they sped off to get me some. But they were so thirsty that they ended up drinking it all before the communal bottle reached me. Toward the end of the visit, I caught the eye of the other female in the crowd: the daughter of one of the players. The gorgeous attentive one-year old at first hid from me in her father's chest but eventually started laughing and waving her arms at me. Her mother was off swimming with the women participants in the summer camp. They had come together as a family to take some vocational training courses and to take advantage of what her father told me was the only educational or self-improvement opportunity they'd been given in the last two years. That's how long they've lived in a camp up in the northeast of the country - a region that one would not be amiss to describe as 'the end of the world'. Two years and three months, I think he said - he recalled their departure from Iraq by the exact date. He'd come with one brother and his wife and a few of her relatives. He has another brother who stayed in Iraq along with their aunt and grandmother. That brother could stay, he said, because his name is Shiite-sounding and their house is in a Shiite neighbourhood. As for this young 23-year old, father of two, he told me he'd had to leave because his name is Sunni-sounding. That, plus the fact that they're Palestinian, was enough for him to have lived under constant threat. When they left, he'd still been studying. He'd had one month left to complete his degree as a technician, but now he's nothing. He's considered unskilled and ignorant. So they came. But because they're Palestinian, they were taken to a camp instead of coming to live in the city like the other refugees do. Unlike most refugees here, from their arrival they have been provided by the UN with meagre housing, food, heating fuel and a few other services. But they are confined to two camps near the border. Nobody works there or does anything significant - except wait for some country somewhere in the world to agree to take them off the UN's hands. I asked him if he wants to come in to this country, and he said that he'd only come if he would be given a passport, be made a citizen of this country. He is tired of living in countries as a refugee. His dream is Australia. "Well," he agreed, "Our foundational dream is Palestine. Of course. But that is not possible, not even worth thinking about." I asked him if he would come live in this country if given the rights of other Palestinians here, which are in fact quite extensive. He said that two years ago, he would have accepted the offer. But after spending two years forgotten at a camp near the border, he will settle for nothing less than citizenship in a country that respects his rights and respects him as a human being. There's a convent here with just a handful of nuns here busy saving the world, one person at a time. They try to keep a low profile, so I won't say too much about them, but I thought I'd give you a rough quote of what one of them told us when we met her a few days ago. The centre we run is little more than a house that our church bought several years ago. There were a couple of dozen Christian families in that neighbourhood and so the house was converted into a church where people could come to pray and then leave again. We did religious classes there for the children, but that was it. Then the refugees came. Before long we had a few hundred children wanting to come to our classes. We got permission from the church to use the downstairs room of the house, which is the church, for doing activities with the children and families. We offer social, medical and educational services as much as we can. The number of people who come to our centre varies a great deal. Sometimes it's a few dozen families a week and other times it's hundreds. When the official service providers stop providing services, that is when many more people come to us. Often big donors will provide resources to the official service providers for six months of food distribution or something like that, but after the six months, the people come to us. We have known many of these families for many years now. But in the last few years, we have seen the people change. They used to come for activities, for company, maybe for food or material help. Now they come to us completely broken. We have seen the change over the years. Many of them now are so poor that they are emotionally unstable for trying to deal with their poverty. Others are coming from war where they have seen awful, awful things. We're only a few nuns and a team of volunteers. We do what we can, but the children are never satisfied. They would like activities all day every day, but we can't take on any more. We have counsellors on our volunteer team, and people come in for counselling every day. We have some professionals who work with us, and because we have built a relationship with them over the years, many of us talk with them, too. This kind of work requires long-term investment in relationships. People now come to us from all over the city, but we can't open any new centres, we don't have resources enough. We are focusing also on the needs of the handicapped and of abandoned children. There are so many children who are here alone, without anyone who cares about them. There is one girl we know who came here with her father. It was just the two of them. When her father died, there was no one to look after her and no one to help her take care of her father's remains either. Another big problem is medical needs, especially cancer treatment. One woman we know has cancer and she has four children. She is dying and can't get treatment, so she has begged me to take her children from her because if she dies and they are still with her, they will be left with no one. Our focus is on the needs of children, youth and women in need. We want to help all of these, from anywhere, and of any religion. The other day I was taken on a home visit to meet two refugee families. These visits are always absolutely heartbreaking and I'm not sure I fully understand how the caseworkers who do this everyday, often several times a week, handle it emotionally. How do you look into the eyes of someone who has seen hell and just wants the simplest little bit of help? How do you do this over and over and over again - to the point that you have no more help to offer? The second family was definitely one such visit. My guides, representatives of a local NGO, wanted me to meet the lady of the house. Her dream is to complete her PhD in English but it is currently impossible. If that had been the entire story, it would have been sad. But that didn't even scratch the surface. She is several years older than her husband and they have a beautiful 4 year old daughter. In their home country, they lived in a city outside of the capital and she was an English teacher at the university level. She has a degree in English and a Masters in Education. She'd received threats since the war began, mostly from fundamentalists who wanted her to stop teaching - particularly to stop teaching the language of the invader. But she had refused to stop. Then, about two years ago, she was pregnant with twins. Since she was already in her forties, the family was very excited about her new babies. But then one day, they came. They took her husband away and she didn't know what happened to him - but when he came back he'd been beaten badly. Then they beat her mother. Then they put a knife to her daughter's neck and told her that if she screamed or made any trouble at all, they would kill her daughter. Then a woman dressed in conservative Shi'a garb came and started beating her, aiming for her belly. Sure enough, she lost the babies and shortly thereafter the four of them - husband, wife, daughter and wife's mother - fled. They came to this country with nothing and soon had even less. Her mother passed away a few months after they arrived and they've all struggled with health problems since the attack. They rent a small two-room flat in a Damascus suburb. It is set up with great tender-loving care, with thin winter blankets currently hanging on the wall to hide the worst water stains and peeling paints. The NGO representatives that introduced me to this family pointed at the two mattresses on the floor that constituted the living room/sleeping room. They told me that they had given the family those mattresses and they were also sponsoring their daughter to go to daycare. Daycare classes have made a tremendous difference in helping her move on from the trauma of what she saw as a mere toddler. They also mentioned that 2 of the NGO employees are taking English lessons with this woman - that way they learn some English and she has a bit of income. The English teacher has been unable to find work. She can't pay her rent each month so she stated bluntly that she will probably have to sell those two precious mattresses to pay the next month's rent. They barely have enough to eat, but hospitality dictated that they went out and bought colas for all four of us. Then she pulled out two books and handed them to me. One was a book of proverbs in English, each accompanied by 4-5 line explanations of the meaning in Arabic. The other wasn't actually a book, it was about 50 stapled pages which upon close examination revealed a basic English-Arabic dictionary. She explained to me that she had written these and found someone who helped her type them up. I can only imagine the way she had saved pennies to buy the notebook in which she wrote the first draft. Then she'd found a publisher who would print a few dozen copies of each book and sell them. She could keep half and he could keep half. But he had not come through and so far she hadn't earned but a few small dollars from that enterprise. But she was trying. The hardest thing, she said, was that she is an educated, cultured woman from a social class that values the finer things of life, including learning. But here she is poor, she is not respected, and she has to make decisions out of desperation, just to put a roof on her family's head and food in their tummies. It was beautiful to see how they three of them love each other and support each other, but when I left I had trouble looking her in the eyes. Moses Cave is a hollowing out, dug with tug by Bludan's great men, along more than one hundred years. The purpose of digging the cave was originally to dig out (Mazar Sand = Quartz sand) for building works. You can notice that most buildings in Bludan and Zabadani were built by this sand, including "Bludan Grand Hotel". The cave was owned by "Mustafa" Family. It was lightened by Kerosene lanterns. There were more than 30 workers, produced daily about 100 m3 of sand, which were packed in saddles and carried away on animals' backs to building sites. After awhile, builders started to use breaker's sand for building instead of "Mazar" sand, which started to be not economic worthy any more, since the cost of digging was much higher than the benefits of the produced sand. Mr. S M is now the owner of the cave. He is "Bludanian", and a relative of Mostafa Family at the same time. He thought of transforming this wonderful structure to a tourist site, so he authorized it and provided all necessary facilities such as roads, electricity, parking, internal and external corridors, gardens and also refresh the natural spring, which flows from the cave's end. In addition to a fruit industrial refrigerators. I may hope ,by this cave, I have added a modest imprint, for the sake of our great country S, and the magnificent town Bludan, showing that this cave is a superior tourist site, which is headed for not only by residents, but also by foreign and Arab tourists. It's a unique model which reflects human efforts working together with nature, in order to make an artistic miracle. I called it "Moses cave" as an appreciation and gratitude for my father "Moses" who was my ideal in patience and facing off difficulties to achieve all desired aim. The cave was officially opened on 22/7/2006, This was during the tenure of the president B A-A. Lastly, the achieved conceptions of creativity and fine taste applied on this monument is not more than 40% of my imagination for this site. and we will surprise you with ore and more. Hi, all! I have had to make a simple change to my blog. I'm now redirecting my blog to http://blog.patrianoceu.org. I don't really think that changes much, but if you use an RSS reader to download my blog, I don't know if it will work anymore. You may have to update your RSS reading program. Sorry for the inconvenience, but thanks for reading. Today we had a meeting with the manager of a coffee shop chain about an event we'd like to do at one of his shops. We met at the coffee shop itself, and he was intent on offering us drinks or cakes or something, but we'd already ordered our coffees so that made his hospitable intentions difficult. He led us to a table where we sat down, joining us for about two seconds before disappearing behind the counter to finish making our drinks and to talk with his employees. As we sat there anticipating our conversation, we considered what evidence we had about what type of person this manager was... and whether he'd be amenable to our proposal. Here's what we ascertained. First, he was much younger than any of us had anticipated, in fact quite young-looking to be managing a chain of coffee shops. Second, he left three items on the table: a sheet of paper, a lighter and a pack of cigarettes. Street fights are actually not an uncommon sight here. It's a passionate culture, and when an argument breaks out it's taken seriously. My favourite street fight story is of the time I saw one car cut another car off in heavy traffic. The driver of the victim-car calmly stopped his car, got out, walked to his trunk, opened it, and pulled out a crowbar. Then he started shouting and running toward the other car, waving the crowbar madly in the air. The two drivers had a bit of a shouting match while the traffic around them stopped and we all watched them argue. Then after about two minutes, the offender-car driver got back into his car, the victim-car driver put his crowbar away and got back into his car, and both men drove away. Traffic picked up again and we were all on our way. Since street fights are not really all that noteworthy here, I didn't really stop to pay attention when I heard shouting and saw a crowd gathered across the street from me one afternoon. I ignored the fight and walked on toward my bus stop half a block down. But it took several minutes for the bus to arrive and my attention was constantly diverted back to the shouting a bit down the road. Usually these fights end quickly when the men are shouted-out, or when someone intervenes to stop them. But this one wasn't slowing down, and everyone in the area was beginning to pay attention. I finally walked back to check it out when I heard the most frightening sound possible in such a situation: a woman screaming. When it occurred to me that a woman might be in trouble, I started to get frightened and not a little bit concerned. So I walked back in the direction of the fight but kept from joining the throng of men crowding around. I couldn't see anything, but I could still hear the girl screaming, or maybe it was more like whimpering. Then I saw a teenage girl come out of the crowd and rush around the corner, along with a young man. I think she was the source of the screams. They huddled together in the entryway of a shop around the corner. But the action continued in the place where it started, as well. There was more shouting and thronging. Then a man appeared from well down the street carrying a wire basket of some sort. He ran toward the crowd, through the crowd, around the corner, and toward the huddled couple. Then the girl's screams picked up again and it seems she started running away from the man. At this point, traffic was ridiculously dangerous, due to the fact that no one was stopping but everyone was looking. It was clear that there were already too many bystanders for me to make any difference, and in fact the crowd might be aggravating the problem. So I walked back to the bus stop and my bus arrived quickly. I got on the bus amidst screams and stares, but no one around me could tell me what was going on. So the questions in my mind... What happened? Was it a robbery? If so, it's amazing that a simple robbery caused a whole neighbourhood to shut down for a few minutes - I guess that is a good deterrent to future robberies. Or was the girl attacked? If so, maybe I should be thrilled that a whole neighbourhood came to her defense in one way or another - or disappointed that people just stared and that she wasn't pulled away from danger more quickly. Who else was stuck in the middle of the crowd, that I didn't see? Was that person ok? What in the world was the wire cage all about???? And, is there anything I could have done? At all? Another character that I met during this weekend of doing non-touristy things at touristy sites was a restaurant owner. His restaurant is perfectly located for attracting a steady clientele: it is the only establishment that sits right outside the entrance to one of the country's top tourist destinations: Crac des Chevaliers, an enormous Crusader castle situated impressively on top of a hill which can be seen for miles and miles and miles. My friend, our driver and I spent the afternoon in this man's restaurant while the rest of our group wandered around the castle. When the group finished their tour, they all raved about the view from the top. It is indeed an impressive view, but the view from the restaurant was nothing to shy away from: the entire valley below, pocketed with villages and farmland, could be seen through a frame of pomegranate and apricot trees. It was all the more inspiring to think that the produce from those trees was a part of our lunch. When we walked in, we were greeted warmly by the entire staff, and even more warmly by the owner. Our visit being off-season and late in the day, the restaurant was empty, so we sat down right next to the window, and the owner joined us for a chat before the meal, and then for a good long visit after the meal. He was a jovial man with crew-cut white hair. His teeth were stained and his skin sunburnt, and he was a bit short and round, but he sat comfortably in his chair and energetically talked about the reason that he doesn't serve a lot of lamb in his restaurant: very few cuts of a lamb are actually good to eat and he only wants to serve the best - and he doesn't want to let the rest go to waste. He explained that to make kibbe naie (a delicious raw meat dish) it can only be fresh, as in the meat can never have been refrigerated. He talked a bit about his plants and his trees and about the flavours he uses. This discourse took place to the backdrop of our tummies growling during the brief wait for our food to arrive. He must know his food well, because each dish was special, uniquely flavoured, and absolutely delicious. He let us eat in silence, but as soon as we were done, he came back. He sang for us, a song about each one. His Arabic was eloquent and poetic, which means I didn't understand much of it. And I'm afraid I've now forgotten the little bit that I that I did understand of the proverbs and poems he recited for us, but I really wish I could have taken out a notebook and written down every word he said. His wisdom and his poise demonstrated a strong education, and a deep pride in his heritage as an Arab from one of the seats of local history. I asked my friend how long he'd been here, working this restaurant. She looked at the driver and he shrugged. They both nodded their heads broadly and my friend said, "Wow. I think he's been around about as long as these ruins have!" I just got back from a weekend of tourism. But since I'd already seen all the sites we were touring (in some cases, multiple times), I spent a good bit of my time hanging out with non-tourists. Guides, hotel workers, restaurant workers, drivers, sales people... It was a chance to remind myself of what life is like on the underbelly of tourism. One character that my friend introduced me to owns camels and horses, and he rents them out to tourists. He also owns a store that sells Bedouin jewelry and scarves and the like. He also sells trinkets up at the top of the town citadel, which he reaches on his motorcycle. He also seems to spend a lot of time hanging out with his mates who also make a living off of their town's tourism industry. My friend and Abu Muhammad go way back. She has watched his children grow up, so she took me to visit his family. His daughters are 9 and 2 and he has the happiest little baby son I think I have ever seen. His wife looks quite young, but apparently she had completed a degree before she married him. They live in a simple but well-situated home, one block away from the major sites. His oldest daughter is bright and doing well in school, and is already practicing her English with tourists who come through town. But before we visited him in his home, we saw him in the ancient city ruins, where he and my friend made a deal to offer sunrise camel rides to members of our group. When he found a taker, he enthusiastically asked her for her hotel name, phone number and room number. A bit offput, the client asked him to just communicate with her via my friend, a suggestion he accepted but reluctantly. He let another member of our group ride his motorcycle while he chatted with my friend and he shook all our hands warmly. Then we saw him again up at the top of the citadel where he must have been selling some trinkets or something. I didn't recognise him when he came up to me with a kuffeya (scarf) wrapped around his face, asking me to give him the baby rose I was holding (a gift from our most excellent driver). Even when he took the wrapping off, I still didn't recognise him, since somehow in the last 1/2 hour he had changed his clothes. Finally, he reminded me that I'd met him a few minutes ago in different garb. So then I relaxed and handed him the baby rose. He gave it back to me with some kind of flowery statement about how my beauty meant I needed to keep the rose. Then some blonde girls walked by and he whispered to me, "Those are Dutch girls. There's something special about Dutch women, they're beautiful." And again, later that evening as I held his son in my hands and as my friend chatted with his daughter, he brought up his weakness for beautiful women. While his wife was in the kitchen making tea, he elaborated on how he just can't resist a lovely woman: he can't help himself, that's the way he is. He loves women. This morning, after the camel ride, my friend mentioned that he'd been flirtatious as always with the camel-riders. And she told me that many of the European women who come to this isolated traditional town, which just so happens to host some amazing historical ruins, actually do fall for this man. After all, he is dark dark dark, with beautiful eyes. Many a European woman has been swooned by him, and he has been happy to oblige. The other day I was walking to town, taking the route I usually take. The sidewalks aren't great, but the road is heavily trafficked, so I generally switch back and forth quite a lot between crooked quiet spaces and car-swept smooth treks. On one such switch, I found myself walking behind a big coach bus. Standing behind the bus was a boy, somewhere roughly around 7 years of age. As I walked towards him, I noticed he was facing the bus, with his head just about parallel to the top of the stowage space under the passenger area. And then as I walked passed him, I noticed that he was peeing on the handle of the stowage area door. Aiming very carefully for the handle, in fact. He looked up at me briefly, then went back to soaking up that handle. Oh, the poor bus driver who had to open that cargo area next! Several questions came to mind. Most basically, Did he have no shame? Did he have no sense that peeing in public might not be such a great idea? I supposed that his parents had never taught him that and, considering other things I've seen in this country, perhaps they actually taught him the opposite: find a slightly isolated area, face away from the world, and fire away. Then, I wondered, Why the handle of the cargo stowage door? Why was he aiming for a part of the bus in the first place? Perhaps there is something innate in a young boy's mind that tells him he needs to aim for something, and that was the something that caught his eye. Or, in a much more interesting scenario, maybe this was youthful revenge! Maybe he knew the bus driver. Maybe the bus driver was his own father, in fact! And he was angry and so aimed for a spot he knew the driver would touch. Oh, or maybe he'd had a negative experience with a bus stowage area in the past, maybe someone had locked him in one or taken something terrible out of one, and this was an expression of his bitterness, of his processing that experience. All in the deep thoughts of a 7-year-old. I'm starting a new series on my blog, to complement the portraits I've been doing and loving. In a social-literary-theory type of a way, I see the portraits as not only moments to capture people I have encountered, but also as pieces with which to build a critical understanding of the culture and issues in the society where I am. In other words, I'm still doing social critique but in, well, hopefully a less "critical" way! So now I'd like to add to that "scenarios", which will add a bit of critique to my portraits. Lately, I've been increasingly noticing that the people I'd like to portrait are mysteries to me. That I find myself making up stories about them to explain what I've encountered. Often it is the very question mark surrounding them that makes them portrait-worthy. See Portrait#29, for such an example. Even though in that case I managed to solve the mystery by the end of the day, it was the curiosity and the scenarios we made up to explain the girl that caught our attention. Anyway, so I present you with Scenarios, a series of portraits where I get to combine my own social critique with an incomplete story and guess at what's going on. Like all experiments, this may be fun or it may not make any sense at all!